Free Delivery within 100 miles of manufacturer. 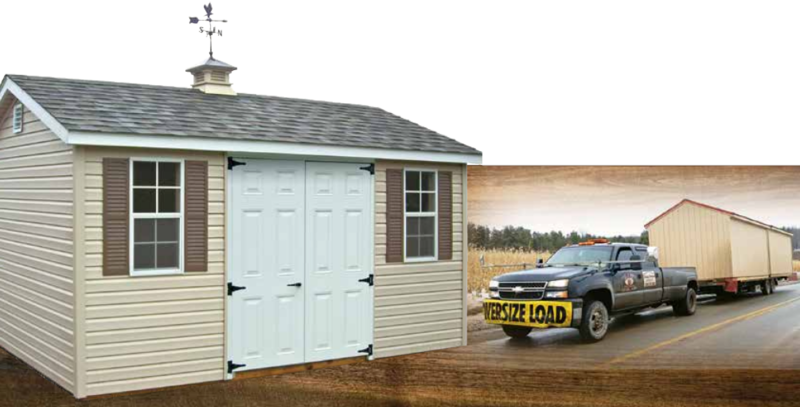 Buildings at the sales lot can usually be delivered within 3-5 days, weather permitting. Ordered buildings can usually be delivered within 15-30 business days, weather permitting. If unable to be at the site when your building is delivered, please be sure to mark 4 corners of building site. Have a clear access path approximately 2' wider than your building and 14' high. Our truck & trailer will not drive on your lawn without your approval. Our shed mover mule is easier on your lawn, minimizing hassle. Site preparation: Make sure all trees, stumps, limbs & other obstacles are removed prior to delivery. Customer to provide level area to set building. Leveling block packages are available at additional cost. Building is to be paid in full prior to or at the time of delivery. Prices and terms effective (4/1/19). All prices subject to correction/change. Not responsible for typographical errors. We offer built-on-site! Tight quarters? Low branches? Don't want equipment in your yard? Request Built on Site, extra fees apply....see store for details!